Well, the shortlist for the 2013 3-Day Novel Contest is out and I'm not on it, which is what I was expecting. I really like the story I started that weekend, but having read many of the winning 3-Day Novels over the past few years, I knew mine didn't have a chance of winning. It was too short, too scattered, and simply felt incomplete. If you haven't read any of those books, you should - it's astonishing what people have created in three days. * (I recommend In the Garden of Men. Or Socket. Or Struck. Or Snowmen, Heidegger Stairwell, The Convictions of Leonard of McKinley...). I held out a small hope for an Honourable Mention/shortlisting (because hey, who knows, right? ), but I always figured that was a long-shot as well. So I was going to blog about what's next for the glorified short story/novella I did come up with in those 72 hours, but then I realized I never posted a wrap-up on the experience itself. So I'll do that first, mostly using my social media updates,** interspersed with the handful of insights I had in my sleep-deprived state. I'd known about the contest for years, and often thought about doing it, but always waited until the last minute, decided I was too busy, and failed to sign up. 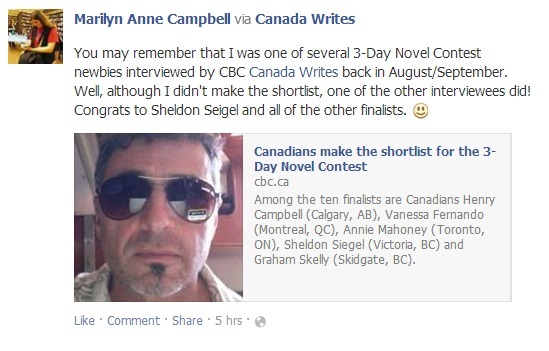 I'm not sure when I decided that 2013 was the year to do it, but I did register in time to receive a late-July newsletter from the 3-Day Novel people which said that CBC Canada Writes wanted to interview some participants. Having already paid the entry fee counted as a certain level of commitment, but talking to the CBC sounded like a way to get myself well and truly backed into a novel-writing corner. I got in touch, and in early August answered some questions about my plans - which were still pretty loose at the time. I had a few ideas I was choosing from - one was far more sensible than the others, but a not-at-all sensible one sounded like a lot more fun. By late August I had settled on not-at-all sensible, which required a lot of research. Click the image to see the ridiculous conversation that ensued. 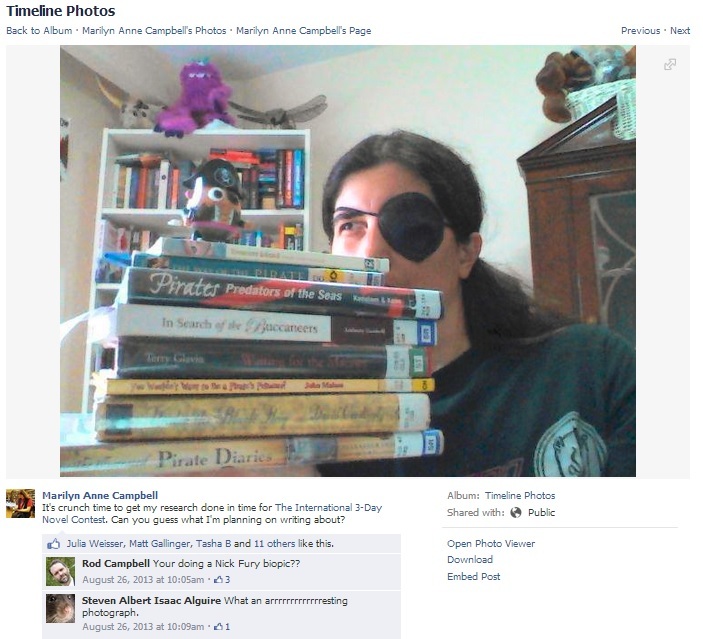 Not only did my idea involve pirates, but I needed to know some of the natural history of parts of the world I've never seen. 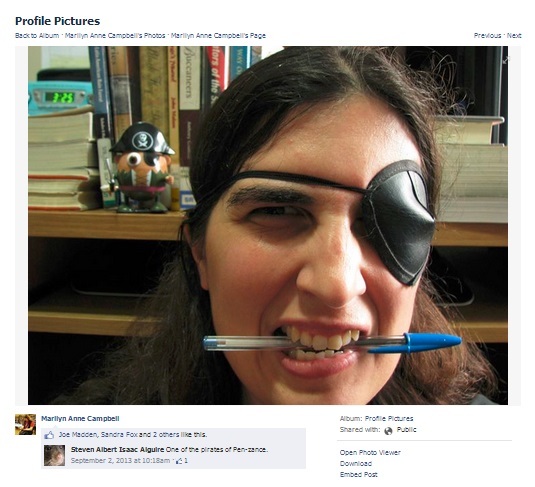 Also, because I'm a goof, I was determined to have my tale be more in line with the reality of a pirate's life, rather than the storybook/Hollywood version we all know best. So instead of sitting around watching Pirates of the Caribbean and Hook over and over again, I had a whole lot of books to read. Which would have been fine, if I'd settled on my story several months before the contest and started researching in earnest then. I had not. This kind of foolishness may seem like a waste of good research time, but this was all part of getting myself as revved up as possible. On August 29th the interview with CBC Canada Writes went online and I wrote a follow-up blog post with more details on my prep. @Shumpgullion How much prep do you need? Are you starting from nothing, or do you have a story in mind already? At this point, I was well and truly publicly committed. But as the above exchange indicates, I was still pretty far from being ready. 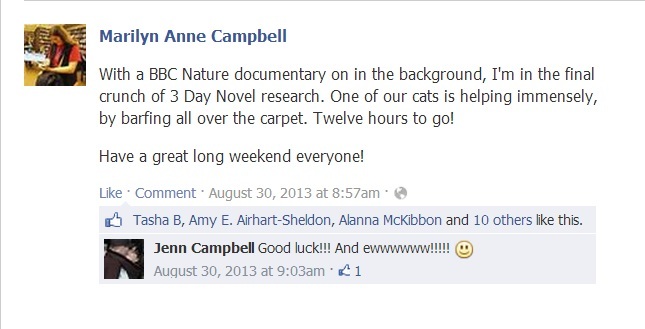 Yes, the BBC doc was part of the research. And so, with not nearly enough background research done and only the barest idea of an outline for my story, the clock started. If memory serves, I was in bed when it did (I think I opted for going to bed early on Friday night so I could start fresh on Saturday morning instead of writing at midnight, but I could be wrong). It just didn't feel terribly urgent somehow, so I spent a lot of time fact-checking in the books stacked beside my desk and going back to change things as I was writing. I know from NaNoWriMo that going back to make changes is a no-no when you've got a month, so when you've only got three days it should be right out. This is where the "judging" became a factor. Unlike NaNoWriMo, which is just about meeting your own word-count goal, I knew someone would be reading my end product. So I as changed something about a character or a setting I kept going back to set that up properly, so the final book would make sense. Long story short, I was going way too slow. I finally picked up real speed as panic set in. It didn't matter if the book had internal consistency - if I didn't get to the end of the story I wouldn't be submitting it for anyone to read anyway. I hammered my way through to the end of the plot, leaving out a lot of flourishes I'd planned. Then in the time remaining, I went back and fleshed out the parts I had time for. 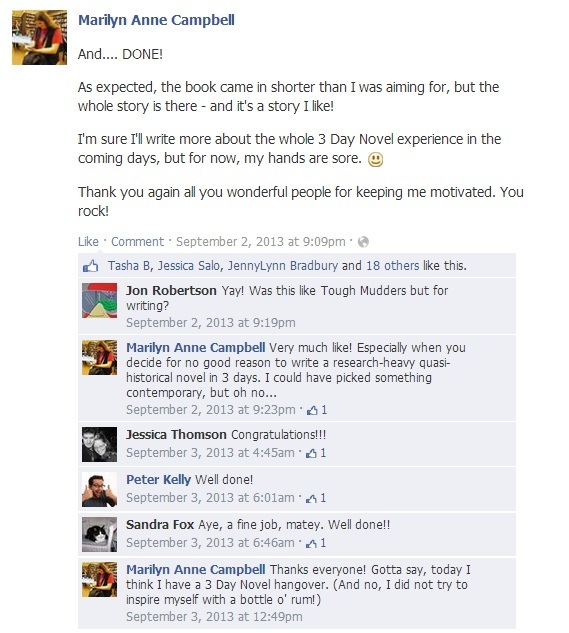 Apparently a lot of people actually finish their novel mid-day on the Monday and take the last 12 hours to edit. During the final hour, I was still writing the final scene. At around 19,800 words my novel was short, but it had a beginning, a middle and an end. It was also the start of a story I really want to tell. I felt really drained on the Tuesday (September 3rd) and was glad I didn't have to go to work that day. I didn't get started on the Exit Interview questions I owed Christopher DiRaddo over at CBC until the evening, and sent them off just after midnight. My Exit Interview was posted on the 5th and in it I summed up a lot of what I've said in detail here - the skeleton was there, I'm glad I wrote the story I did, but I was too slow and my final book was too short. Since I knew I had no chance of winning, I told myself that I should just keep working on the novel while the scenes were fresh in my head (because the 3 Day Novel Contest offers a publishing contract to the year's winner, editing your manuscript before the winner is announced isn't recommended; at the very least, you need to keep a copy of what you submitted, and start a fresh file if you're going to make changes). I did write a little bit more to expand the draft after I'd submitted my entry, but I'd had other works-in-progress on the go before the Labour Day weekend, and those slowly took over again. I know part of this is because even though I wasn't going to win, I had a mental block telling me I shouldn't work on it until the contest was well and truly over (I also had a trip planned in September to see the premiere of Flood Control in Winnipeg, so that helped with the de-railing). 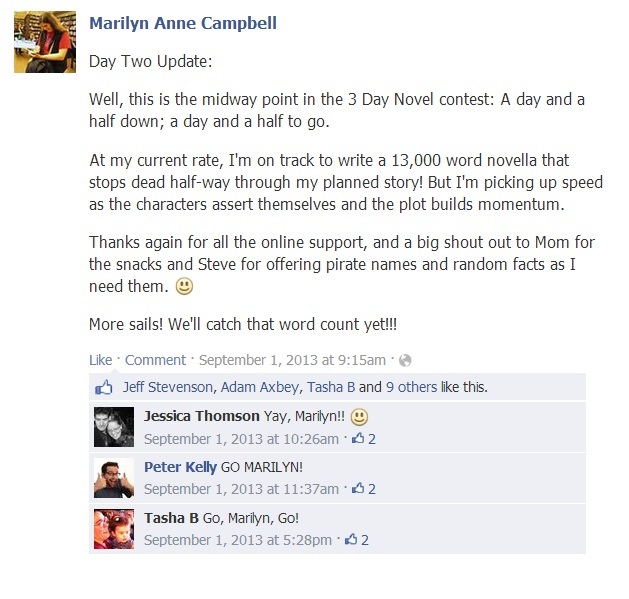 A 3-Day Novel Contest newsletter sent in October said that the winner would be announced at the end of January 2014. That didn't seem too far off, so that was when I put the project away entirely until the results were announced. Then the December newsletter moved the date of the winner-announcement to the end of February. February came and went with no further news. It was, I'll admit, quite frustrating. I know that if I want to be a productive writer, I have to just keep working on the writing, but the urge to hit "refresh" on email inboxes and contest websites can get very distracting when news is running late. Finally in Mid-March there was a newsletter with some stats. 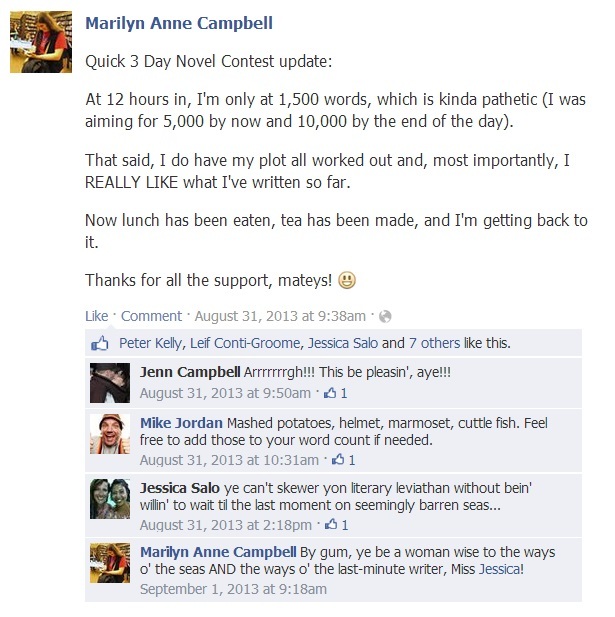 In 2013, 472 people registered for the 3-Day Novel Contest and 260 of us actually submitted a novel for judging. Then on March 28th, the list of ten finalists was released. I wasn't on it, but I'm pleased that one of the other CBC interviewees made the cut. According to Sheldon Seigel's CBC Exit Interview, it seems his characters changed his plans, taking him "somewhere unexpected and glorious." If you're sitting on the fence about entering, do it. At least once in your life. C'mon, you know you want to (I'm glad I did). Remember, from the minute the clock starts, you're already running out of time. Don't waste time reading anything on social media. If you want to keep your people updated with how you're doing, go ahead, but don't linger. The internet will be there for you to read on Tuesday. Speaking of Tuesday, book it off work if you can. A day of recovery may be necessary. Have your meals planned and your snacks at the ready. Unless you live with someone super-supportive who will make all of your food, and a mom who sends you jelly beans and coffee and a motivating poem to keep you going. Then you don't need to worry about planning as much. Complicated, research-heavy stories can be fun, but are really not a great idea for The 3-Day Novel Contest. At least not on your first attempt. This is when "write what you know" is at its most useful. That said, if a historical epic is what you're most passionate about writing, go for it. You need to be really excited about what you're working on. 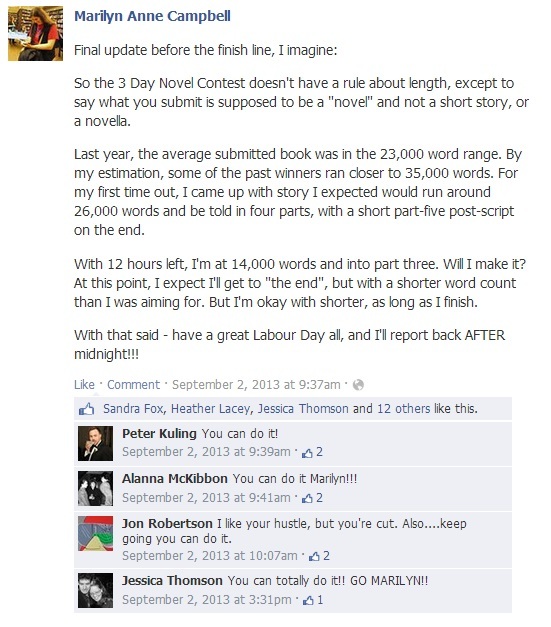 And even more importantly, you should work on a book you want to keep working on long after the contest is done. With only a 1-in-260ish chance of winning, you're better off focusing on the telling of a story as your end goal, not the winning of a contest. "Will I do it again?" Right now, I'm not sure. It was a great way to get a draft done, and I did enjoy the experience. But I still have a number of unfinished works on the go, and to start a draft of something new at the end of August actually might not be the best idea. I guess it depends on where I'm at by the time the early-bird $35 registration deadline rolls around, presumably in July again. What about you? Have you done the contest, or are you thinking of throwing your writing hat in the tiny, tiny 72 hour ring in 2014? * Yes, I know some editing is done before publishing. **And yes, for those in the know about this sort of thing, I did try to make this with Storify at first, but it wouldn't load my Facebook status updates as anything other than headlines. So back to screen grabs it was. It was my first attempt at Storify, so if anybody can guess what I was doing wrong or knows if that's simply as much as you can get out of Facebook posts, please enlighten me in the comments. It's that time of year again and I just stumbled on your post (via twitter). I'm gearing up for another 3DNC weekend and.... the nerves have me poking around online in search of solace. Loved the post and wonder.... are you going to play again this year? I will search your blog for clues. Yes, I was rather remiss in not posting an update this year. So I wrote one for you!